Ah, Christmas, one of the biggest holidays of the year. All those fancy decorations in the store can add up quickly, but did you know you can make beautiful decorative pieces that look as good (or better) than anything you’ll find in the store? Well, if that interests you, read on my friends. This week is all about decorating your space without breaking the bank or testing your patience! So here are my five projects to easily decorate your space. If my ideas don’t speak to you, check out Pinterest, you’ll find something that you want to try! Just because there might be snow on the ground doesn’t mean you have to resign yourself to indoor decorating. I love the idea of adding planters to your outdoor decor with splashes of conifer branches (think spruces and pines) and evergreen branches (magnolias, boxwood, etc.). Colorful berry branches can add some eye-catching detail as well. A Piece of Rainbow has an extensive post on how to put together these beautiful pieces of art. Check that out here. 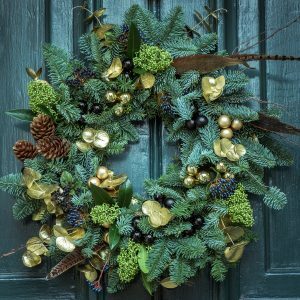 A plain wreath (like a plain willow or pine wreath), wire form or Styrofoam wreath form. Picks, such as pine branches, poinsettias, holly, etc. other decorations (I like to add decorative ornament balls to wreaths for accents). Just attach everything with a hot glue gun and allow to dry. To hang the wreath, I recommend an over the door hook. You can find these at most big-box stores, even the dollar store. Failing that, check out Amazon. Now that we’ve gone over some inspiration to make your outdoors a little more festive, let’s bring it inside. This can bring a table together. I recommend choosing a centerpiece that is the same shape to the table you’re placing it on for a bit more symmetry, but it’s not a hard and fast rule. It’s YOUR table and your centerpiece, it has to make sense for you and what you wish to use it for! So to make your own, you will want to grab a couple of things to throw together. This list is by no means exhaustive, have a little fun with it by putting your own personality into it. A bowl, plate, tray or another container. I love natural wooden looks and it need not be fancy because you’re going to add the fancy to it! Walmart or your local dollar store will likely have something suitable, failing that, check out Amazon. Pinecones (check out this super neat tutorial on how to prepare pinecones for crafting from Tip Nut), that way you can just head outside and pick some up from your yard or a local park (always double check that it’s okay for you to pick them if you aren’t grabbing them from your own property!). Evergreen picks (think tree branches, you can do real ones, but the fake ones are probably easier to find at Walmart or your local dollar store). Mason jars (you can even add some flair by painting them with spray paint or check out a unique project from Stone Gable). Winter flower picks, poinsettias are great additions to most centerpieces. Just arrange all the items on the tray, for added security, you can attack most of them with a hot glue gun so they stay put. Your tree will be the most focal point of most of your holiday decorating, so why not jazz it up with some cool DIY ornaments? 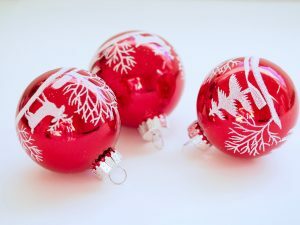 You can easily make a whole array of your own ornaments instead of buying them at the store. I like to start with the clear ornaments that you see at Walmart, the dollar store may have some and if you just can’t find them locally, Amazon has a nice decently priced sets. Fill them with branches or fake snow (or other Christmas picks). Paint them – I recommend using a spray paint or I’ve even seen people use nail polish to paint the outside (Check out a sweet tutorial Alice & Lois). Hanging up Christmas balls on light fixtures is a perfect, quick and low budget way to add some holiday spirit to your space. Just attach them to some fishing wire and hang them off your chandelier or other light fixture. For added cheer, wrap some garland around there as well! You can also hang ornaments in your windows as well! You don’t need to have an insane budget to be able to add a little holiday cheer to your space. 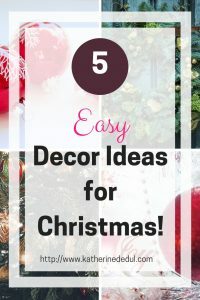 Most, if not all of these projects will cost you under $30, maybe a little more if you don’t already have a hot glue gun hanging around for the wreath project. I hope you found this blog post useful and if you did, share it on social media, spread the holiday cheer! Please also share the love by pinning to Pinterest. Finally, if you have a favorite craft or just want to say hey, drop that down below into the comments! Aaaand, if you want to receive more crafty ideas, delivered straight to your inbox, enter your email down below. As a thank you, I will give you the very worksheet that I use when I need to complete a new craft for here on the blog! Next week’s post is all about Christmas party ideas, so stay tuned and until then, happy crafting!